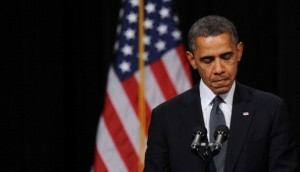 At a vigil on Sunday in Newtown for the gruesome school shooting, the US President Barack Obama told residents that he would use the powers of his office to prevent a repeat of the tragedy. In one of America’s deadliest primary school shootings, twenty children and six women died in the assault by a lone Adam Lanza at Sandy Hook elementary school. The assaulter later took his own life – he had earlier killed his mother. Following the Newtown massacre, there are renewed calls for stringent gun-control legislation. On Tuesday, White House Press Secretary Jay Carney said that President Barack Obama supported the idea of a bill that would prohibit the manufacturing of high-capacity magazines. The industry lobby has been accused of wielding great power over lawmakers to loosen control on gun ownership in the US.